That's almost 40 per cent more than the year before. A new study estimates nearly 40 per cent more Canadians are leaving the country for medical care. A Fraser Institute report released last week estimates 63,459 people left the country for non-urgent medical treatments in 2016. That figure is up from 45,619 the year before, marking a 39 per cent increase. British Columbia saw the highest percentage of patients seeking medical treatment abroad in 2016— 2.4 per cent— while Ontario had the highest estimated number of patients— 26,513. Authors considered long wait times as a possible reason why Canadians are electing to go elsewhere for care. 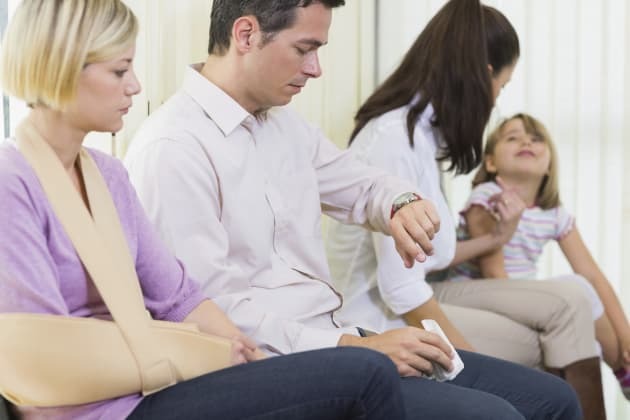 According to the institute's study of wait times in Canada's health-care system, the average patient waits 10.6 weeks for medically necessary treatment after seeing a specialist. More than 63,000 Canadian patients travelled abroad for medical care last year. Yanick Labrie, Fraser Institute senior fellow and co-author of the study, told HuffPost Canada there are many different reasons why people choose "medical tourism." "We cannot clearly pinpoint one specific question," he said. "But obviously there's a correlation between the wait time situation and the decision to travel in foreign countries." The numbers are based on a survey sent to Canadian doctors, who area asked to provide a percentage of their patients who travel abroad for treatment. The numbers are then compared to statistics from the Canadian Institute for Health Information (CIHI) to get final numbers, Labrie said. But other experts say those numbers aren't accurate. Jeremy Snyder, a health sciences professor at Simon Fraser University, told CTV News that physicians are essentially asked to guess how many of their patients travelled abroad for treatment. The Fraser Institute says they're still seeing rising numbers and a correlation between longer wait times and increased medical tourism. "I don't think there's a really strong backing for them," he said. Labrie defended the results by saying with any survey, the numbers may not be exact, adding the physicians they surveyed have no reason to lie. "Let's assume it's not accurate, that even if the numbers were only, let's say 50,000 people. That would still be a problem," he said. He said the Fraser Institute has been conducting the same survey for years, and they're still seeing rising numbers and a correlation between longer wait times and increased medical tourism. "Probably it's an underestimate as well, because many people travel abroad and they don't tell their physician if they cannot get access to an appointment with a physician rapidly," he said. In B.C., which had the highest percentage of patients seeking medical treatment abroad, Labrie said many of the province's targets for wait times are not being met. Labrie said having more "freedom of choice" within the health-care system would help reduce wait times. He compared the two largest provinces of Ontario— which had the largest number of patients at over 26,000— to Quebec, which only saw 4,603 patients leave for treatment. He said Quebec has more options in the private system, which allows for reduced wait times and fewer patients leaving the province. Yanick Labrie said "freedom of choice" in the health-care system would help to reduce wait times. However, a two-tier system is not necessarily the answer, Labrie said. He pointed to Western Europe as an example, where many countries with universal health care have more provider options within the public system. "We don't discuss that issue in the paper, but in other studies that we've done, we discuss the issue of letting people decide where they want to get that treatment within the universal system in Canada. And we should try to emulate what other countries have done in the recent past." More competition could lead to shorter wait times in Canada, he said. He added it's not just the wealthy who make the decision to leave Canada for medical treatment. "Either it's the rich or people ready to make important financial sacrifices in order to have faster access to the treatment they need."